Greed is a virtue at any Michael White restaurant. After all, the New York-based chef, who’s not exactly a tiny man himself, is a firm advocate of heavy, indulgent food. A signature app at his two Michelin-starred Manhattan eatery Marea pairs sea urchin with lard and a few flecks of sea salt; his few-month-old Osteria Morini draws in adoring foodies with handcrafted pastas blanketed in truffle butter or duck liver cream sauce. 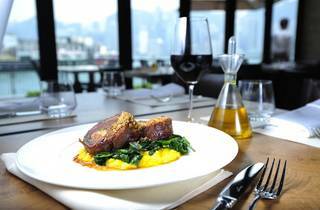 And at White’s first venture in Hong Kong – a collaborative effort with local restaurant group Dining Concepts – the ethos of hearty, Italian eating translates into a brilliant menu that reads like a song. Occupying a gorgeous waterfront site right by the ferry pier, Al Molo channels the sort of Beaux-Arts aesthetics that defines so much of Manhattan’s cityscape. Plank ceilings, exposed brick walls and long marble countertops come courtesy of NY-based design firm Avroko and Hong Kong’s Zanghellini Holt. Open cooking stations run down both sides of the dining room, flanked by a well-stocked bar that leads out to a casual alfresco seating area by the harbour. For the most part, the menu is a solid testament to White and his appointed head chef Jimmy Everett’s (a Marea alum) culinary cred. The cuculli ($48) from the antipasti portion of the menu is well executed with a deep-brown crust enveloping a mix of chickpeas and pounded cuttlefish. It’s close to delightful after a quick dip in the brightly flavoured lemon crema. The arancini ($48) is cheesy, warm and gooey on the inside with bits of ‘Nduja adding bursts of spiciness. Squash flower fritters ($118) are plumped up with strips of buffalo mozza and are served over a bed of chunky, fresh tomato sauce. But it’s really the pork rinds ($38) that will convert you, deep-fried to crispy puffs and perfectly seasoned so they crackle and pop and leave bits of herby rosemary salt on your fingertips. 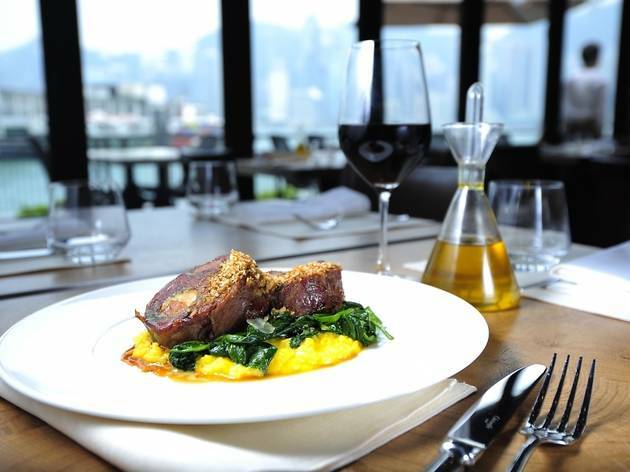 The restaurant’s rendition of the classic Milanese osso buco ($258) also deserves special mention. Two large hunks of veal shank are plated over a mound of slightly over-saffroned risotto and wilted spinach. The well-browned meat falls into delicate, milky strands around a piece of herb-sprinkled bone marrow. The marrow is intoxicatingly delicious, imbibed in such a rich symphony of flavours that the taste lingers long on the palate even well after the meal is over. Desserts also manage to hold their own, thanks mainly to pastry chef Jerry Thornton (who divides his talents between Al Molo and neighbouring BLT Steak). The seemingly simple tartaletta ($88) combines a profound layering of tastes and textures; the buttery pastry crust is painted with a crunchy coating of feuilletine and crushed hazelnuts before being filled to the brim with smooth, gianduja chocolate and a scoop of hazelnut crunch gelato on the side. Not all dishes work though. The crudo platter ($128) for example, though a pretty composition of colours on the plate, is nothing too riveting for the palate. The trio of wild-caught yellowtail, bigeye tuna and sweet prawns tastes ocean-fresh but is too minimalistically dressed; the brine of the olives, and the bold flavours of oregano and sun-dried tomatoes all fail to shine through the thin slivers of raw seafood. Likewise, the Acquarello risotto with razor clams ($178) falls a little short of expectation with the clams diced into small bits before being carefully folded into the rice. The clammy bits are delicious, carrying a touch of ocean-spray sweetness, but the delectable flavours are lost within the heavy mass of Carnaroli rice. Shop G63, G/F, Ocean Terminal, Harbour City, 7-23 Canton Rd, Tsim Sha Tsui, 2730 7900. Daily noon-11pm.